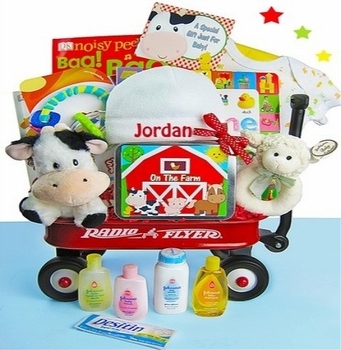 This fun and educational mini Radio Flyer wagon set is stuffed full of farm themed gifts for the new baby. This set features a soft fleece hat embroidered with the baby's name for a thoughtful touch. Baby will love to interact with the toys and books while discovering the sights and adventures of the farm with these wonderful items.